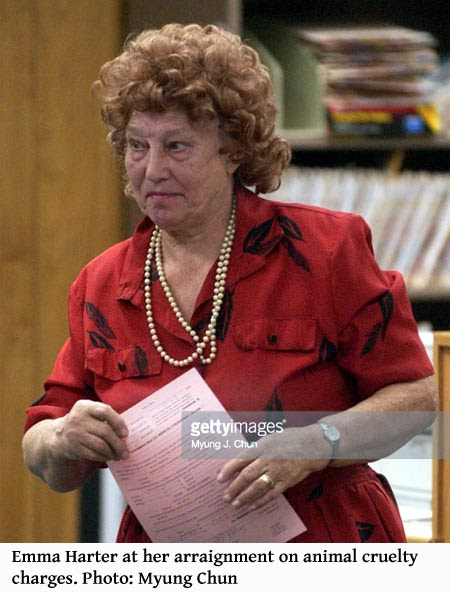 CALIFORNIA -- A 72-year-old woman who allegedly kept more than 230 Chihuahuas at her Acton home was ordered Friday to stand trial on charges that include animal cruelty and battery on an animal control officer. Emma Regina Harter could face up to three years in prison if convicted. But Deputy Dist. Atty. Steven Heller said he would not recommend incarceration. "Based on her age, the nature of the case and her lack of a criminal record, we would be looking to put her on probation, order her not to possess any animals, get her counseling and have her pay restitution for the dogs' impound fees," Heller said. The fees could reach $500,000, he said. 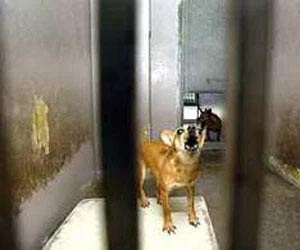 The dogs were seized from Harter's property in November and placed in the custody of the Los Angeles County Animal Care and Control Department. Many were inbred and had severe behavioral problems. More than 50 have since died, officials said. "These dogs were very aggressive, and some of the larger dogs killed several of the other dogs," Heller said. In August, a judge ordered that 177 of the dogs be turned over to Burbank-based Chihuahua Rescue for training to make them adoptable, if possible. 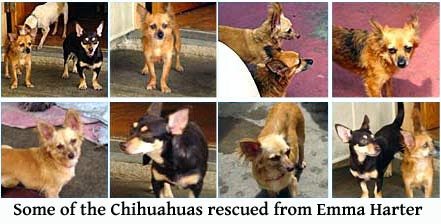 The Chihuahuas have since been dispersed to six rescue organizations and a boarding house for dogs, said Kimi Peck, executive director of Chihuahua Rescue. About 40 of the animals have been taken in by private homes, Peck said, but many of the others are still too wild for adoption. Superior Court Judge Lisa Chung found sufficient evidence to require Harter to stand trial after two days of hearings that included testimony from an animal control official and a county veterinarian, Heller said. Harter's arraignment is scheduled for Sept. 18 in Los Angeles County Superior Court in Lancaster on two felony and five misdemeanor counts, Heller said. Peck said she was surprised and pleased about the charges. "I'm for whatever it takes to stop her and other people like her from creating these horrible situations," she said. GEORGIA -- A Thomaston woman was jailed Thursday after police and Upson County animal control officers found 15 sickly dogs and a "sea of filth" in her Green Street house. Shirley S. Eubanks, 49, 517 South Green Street, was charged with 15 counts of nuisance ordinance violations after police were called to her house just after 10 a.m.
"The odor was so strong we didn't know what was going on and by the time we got in the house, we found she had 15 dogs living with her," said Thomaston Police Officer Bobby Ellington who is in charge of the city's Animal Control Division. "The smell was so bad from the street, we were concerned there might be a deceased person inside," Ellington said, adding the Green Street case is the worst he has seen in years. Relatives told The Times the woman did not intend to mistreat the dogs, but took in more strays than she could handle because of her love of animals. The investigation of the house was conducted jointly by the city and county animal control, including Animal Shelter Manager Smart Web. When police and animal control officers got inside, they found the floors covered with feces, the house damaged and in disarray and flea infested. "A situation like that is awful" said Annie Johnston, an environmental health specialist with the Upson Health Department. "A situation like that can cause different illnesses, most notably intestinal tract problems." 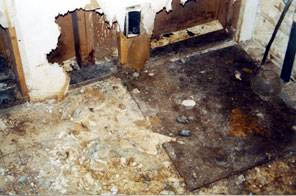 According to reports, the dogs, mostly smaller mixed breeds, caused between $20,000 to $30,000 in damages to the house. "We run into problems like this from time to time in the county, but this case is bad," Web said. 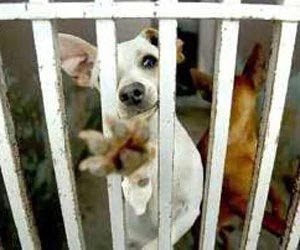 "A lot of these dogs have health problems ... These dogs are in pretty bad shape." He said the dogs would receive treatment for fleas at the shelter. Web said problems such as this need to be addressed and that he is thankful to receive cooperation from the Thomaston Police Department and the Upson County Sheriff's Department. "People often want us to get involved when they see situations like this, but the problem is that we just don't have enforcement authority," Web said. "We have to call the police or the sheriff's department, but by the time they get there, it is often too late."